It is 1990 apartheid is on its last legs and so is John “Spud” Milton who is about to enter his first year in an elite boys-only boarding school in South Africa. That might end up killing him. With illegal night swims, contraband, faked religious conversions, sociopaths for teachers and dorm mates who will do anything for the thrill of it no matter the risk. Spud wonders why he came here in the first place,but things are not much better at home. For Spud has been cursed with two completely dysfunctional parents and an insane granny called Wombat who has no idea who he actually is. Armed with only his diary and his wits spud will have to withstand four years in this ghastly hellhole. 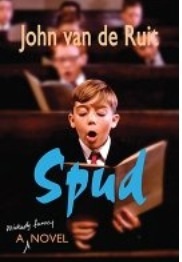 Can Spud survive his first year in boarding school and achieve his dream of getting the top role as Oliver in the school musical? Or will he perish in the scolding flames of young adulthood? I first read this book in South Africa and I must say all I read during that period was the Spud series With loads of twists and turns it is the perfect book for all teenagers with a taste for adventure. Next Next post: Heroes of the valley.